Champion mare Black Caviar has been retired. Her retirement was announced by managing part owner Neil Werret and trainer Peter Moody on April 17th – almost four years to the day after her debut win down the straight at Flemington (April 18th, 2009) when she blitzed her rivals to score by 5 lengths at odds of 2/1. The mare famously won her next 24 starts – and started at odds on in every one of them. Her average winning margin was an amazing 3.2 lengths - and it could have been much greater as more often than not her regular jockey Luke Nolen didn’t push her out in the run to the line as she had her rivals covered well before the finishing post. The fact that Black Caviar won all of her 25 starts is only part of the story. In many of those victories there were moments of high drama and excitement that will stay with racing fans forever. One of her most memorable victories was in the 2011 TJ Smith Stakes at Randwick in which Hay List, a seven time Group winner and a star in his own right took on Black Caviar - which by that stage had chalked up 11 straight wins. Hay List kicked 4 lengths clear of the mare early in the home straight and the gasps of the crowd were clearly audible as he momentarily looked to have the champ beaten. However, Black Caviar dug deep over the final stages of the race and overhauled Hay List to score by 3 lengths – with a further 5 lengths to the third place getter. The mare’s most famous victory came in June 2012 when she scored her 22nd consecutive win in taking out the Diamond Jubilee Stakes in front of Queen Elizabeth and a capacity crowd at Royal Ascot in England. Despite being unsuited by the rain effected going, being injured in the run and her jockey Luke Nolen having a ‘brain fade’ and easing her up before the finishing post - she somehow still won. Black Caviar beat the UK and Europe’s best sprinters that day. Moonlight Cloud which finished second, won her next race in France - a Group 1 event by 5 lengths. Stung by the experience of nearly causing Black Caviar to be beaten by easing her up before the finishing post, Nolen rode the mare right out to the line at her very next start in the Group 1 Lightning Stakes - which led to her breaking Special’s long standing track record for the Flemington 1000 metres - thereby silencing the critics who doubted the mare’s ability as she had never held a course record. Black Caviar not only had a great impact on those involved in the racing world – she attracted people to the race track who had never before stepped through the turnstiles – and the experience of seeing the superstar perform in the flesh and being immersed in the excitement of the atmosphere that she generated left them with stories to tell future generations – just like those who saw Phar Lap race all those years ago. Black Caviar sold out arenas like a rock star. At her two starts in Adelaide at Morphettville prior to her Ascot victory she raced in front of capacity audiences - drawing 30,000 people to the races on both occasions – ten times the number that would normally go to the track for such meetings. With her star quality and unmatched ability she had the huge crowds cheering her on and flourishing flags in her famous black and salmon colours with fervour. Heading over to England for the Diamond Jubilee Stakes at Ascot, she created such a buzz leading up to the event that she again performed in front of a sell out crowd - and she lived right up to all the hype with a performance that literally had the audience on the edge of their seats and wanting an encore. 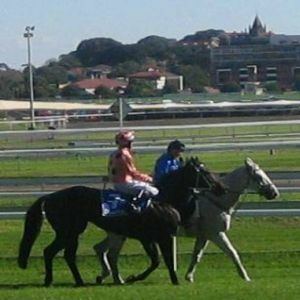 The extent to which Black Caviar touched people with her magic is evidenced by jockey Josh Parr’s comment after the running of her last race - the 2013 TJ Smith Stakes at Randwick. Parr rode two time Group 1 winner Atomic Force in the event. The horse started at odds of 200/1 and finished ninth in the race – beaten by over 16 lengths. Normally, finishing ninth in a race wouldn’t rate a mention with such a well credentialed rider. However, asked for a comment after the race Parr said “I didn’t figure anywhere near them – but it was probably one of the greatest things I’ve ever experienced ”.